Traveling with your baby can be rewarding—as long as you plan ahead. Step one? Pack wisely and bring your sense of humor. You know the feeling: You're walking down the aisle of a plane, carrying your baby, and no matter how sweet and quiet she is, everyone is looking at you and clearly hoping you don't sit by them. Newsflash: Traveling with your baby doesn't have to be a battle for sanity. While our first plane trip with our daughter was fraught with anxiety, the actual vacation itself was wonderful, and by the time we were traveling with our second child, I had chilled out. Sure, he cried on the plane, but my ability to keep calm did a lot to diffuse the situation. I had come prepared with snacks, entertainment, extra clothes and, most importantly, the right mindset. 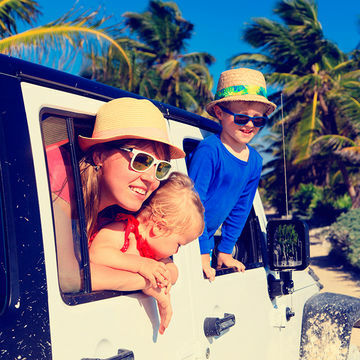 When it comes to traveling with your bundle of joy, a little preparation goes a long way—and maybe by the end of your journey, your baby (and you) will have plenty of new friends in your fellow travelers. Take advantage of flying with your kids while they're under 2 and can still fly for free on your lap, advises Colleen Kelly, host of Family Travel on PBS. "Bring plenty of diapers, wipes, formula, [if you use it], and extra outfits in your carry-on in case of a flight delay or long layover," she says, and be sure to also bring an extra shirt for yourself for those unexpected food spills or worse. Additionally, make sure you've reviewed the latest TSA requirements so security isn't any more harried than it needs to be. For instance, you can carry on milk or juice as well as a breast pump if you need it—an exception to the 3.4-ounce rule that applies to other liquids. And while we're talking breast milk, many airports are starting to introduce mom's rooms for breastfeeding and pumping, so check out your airports' websites to see what amenities are offered. For the plane ride, have lots of age-appropriate entertainment options available—maybe surprise your little one with a new toy or two—and hope that your baby sleeps through much of it. It's a good idea to feed him as you're taking off and landing to help alleviate the pressure in their ears. If she cries, seriously don't worry about it. Most of your fellow travelers have been in your same position, and if they haven't ... oh, well. You can only do so much, and the sound of your baby crying is probably 10 times more stressful for you than it is for the people around you. The anticipation (dread?) of several hours or more in the car can sometime be worse than the reality. We've had plenty of trips where our kids slept most of the way, making those few little pockets of hysteria manageable. To get the best chance of en-route sleep, try to time your drive during your baby's nap so he's already tired, and consider opting for an Elizabeth Mitchell playlist on the stereo rather than the latest Kendrick Lamar album. If you're traveling with your partner or another adult and there's room, consider riding in the backseat with your baby to soothe her when she starts to get upset. Budget plenty of time for your drive, since you might need to stop multiple times to feed your baby, change her diaper or just give her some time out of the car seat to calm down. We've found that every road trip is different—sometimes they're a piece of cake, sometimes they threaten to leave us with half a head of gray hair. Thank goodness gray hair is a sign of wisdom. As you prepare for your trip, make sure you pack what you can't get where you're going or wouldn't want to buy: clothes, baby spoons, if you need them, enough diapers and wipes for your journey, snacks and maybe enough baby food for the first night. If you're staying someplace where shopping is easy, consider buying diapers, food, wipes and other temporary essentials when you get there. Another great service offered in some vacation spots are baby rental shops. The last time we went on a family trip to Florida, we rented a car seat from the rental car company and then rented a portable crib and even an exersaucer and some beach toys from a shop that specializes in baby rentals. We did bring a stroller with us—we opted for a medium-sized one that was comfortable for our kid and had a good sun visor, but was also really easy to fold up. It was a little heavier, but he spent so much time in it that I was glad we opted for something a little more substantial than an umbrella stroller. He even napped in it by the pool or on the beach most afternoons—fantastic! If you're going overseas and bringing your own car seat, Kelly suggests making sure it meets the standards and regulations of the country where you're headed. "Also, since car standards may be different in other countries, installation may not be the same overseas," she says. "Take the time to check it out in advance of your travel dates." Since some babies have a hard time falling asleep in a new place, she also suggests bringing a crib sheet or blanket from home. "But the trick is, don't wash them first!" Kelly says. "The familiar smells from home will comfort your baby and help them get in those much-needed naps." A good white-noise or lullaby app on your phone can also help your baby sleep—so you can have fun on your vacation, too! For more family travel advice from Colleen Kelly, go to familytravelck.com and look for her show on your local PBS station.